Jose Estrada, Raul Giron, Susana Rosas (professor), John Ly, B. Alexis Borgstedt (alumna and Fall 2012 contributor), Lien Quach, Marissa Robinson, Cassie Gianni, Michelle Hernandez and Sergio De La Vega, worked as business consultants for Power Mundo, providing the people of Pucallpa and surrounding areas with a solar-powered lantern the Sun King Pro. Plans change. Many know this and adjust hesitantly. 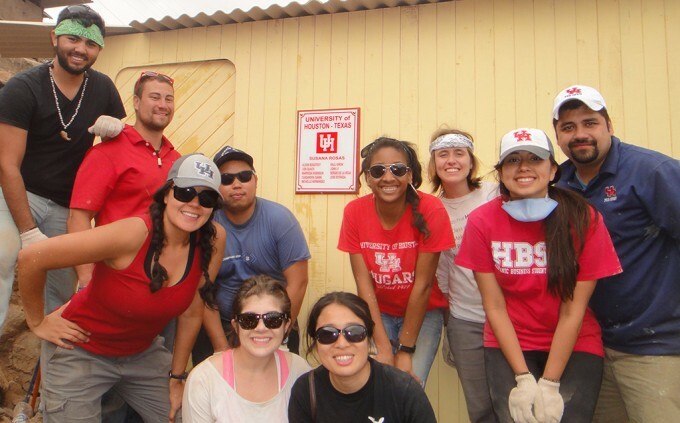 A group from the University of Houston C. T. Bauer College of Business, though, embraced modifications in their itinerary during a recent international trip because it meant even more doors opened to afford them the opportunity to help the impoverished area of Pucallpa – their social business’ target market. Working as business consultants for Power Mundo, eight students and Susana Rosas, professor for the Sales for Social Impact course for the past three years, provided the people of Pucallpa and surrounding areas with a solar-powered lantern the Sun King Pro. The first of its kind, the Sun King Pro (SKP) also serves as a mobile device charger, delivering high and long lasting performance. With one day’s charge, the SKP can last up to 30 hours and shines 10 times brighter than a kerosene lantern, which is currently one of the main sources of light in Peru. Bauer junior Raul Giron said the lantern was an improvement from others introduced in Pucallpa previously – and as he and the students learned almost immediately – their previous research and findings were confirmed; the need there is great. Bauer students show the town of Pucallpa how to use the Sun King Pro (SKP). The trip was the end result of the Sales for Social Impact (SSI) course. In its third year, the course is designed to teach students how to market and sell products that can improve lives through sustainable business models. Additionally, the group was afforded the opportunity to market their product through mass media, spreading their message on local television and radio programs and even found themselves splashed across the leading newspaper. The course this semester, led by Rosas, expanded its comprehensive look into the bottom of the pyramid by starting off the year with a retreat in Waco with a poverty simulation that ignited the team’s unique bond. The poverty simulation experience helped them understand what it is truly like to be impoverished as they lived as a homeless person for 48 hours, enlightening them to the idea of surviving by any means necessary. This led the group, on their own accord, to present the people of Peru with 500 pounds of personal donations upon their arrival to the country. Doors continued to open throughout the trip that provided the students opportunity to help the Peruvian community on behalf of the schools name. Working with a non-profit unrelated to their business plan. They invested, built, and gifted a brand new house to a family of three – unplanned prior to the trip. Through the encounter and many others, the students realized the course was more than lectures, taking notes and exams. Cassie Gianni, an Economics junior, said it encompassed theory and implementation. “The course challenged me to channel my background in economics and international development into a focused and comprehensive sales plan,” Gianni said. “As my first thorough exposure to business, I learned exponentially each and every week of the semester.